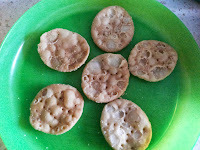 Variety of Indian simple and easy Recipes with photos to help you understand easily. One can get all kinds of yummy,tasty and awesome Konkani food recipes along with North and South india's famous dishes. Bachelor's label consists recipes which are much simpler, tastier, faster and easier especially dedicated for all the bachelor's and freshers with less cooking experience. India is well known for it's chaat items. 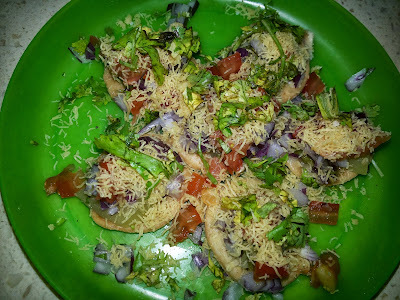 The taste of chaat items varies among different states. 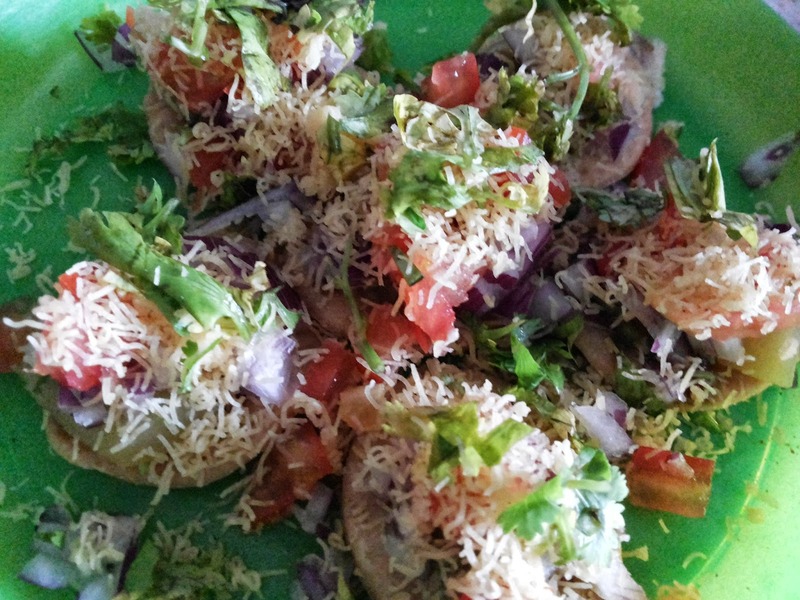 Sev puri is famous in the streets of Mumbai. My favourite chaat item which can be easily prepared at home and is a very healthy dish. 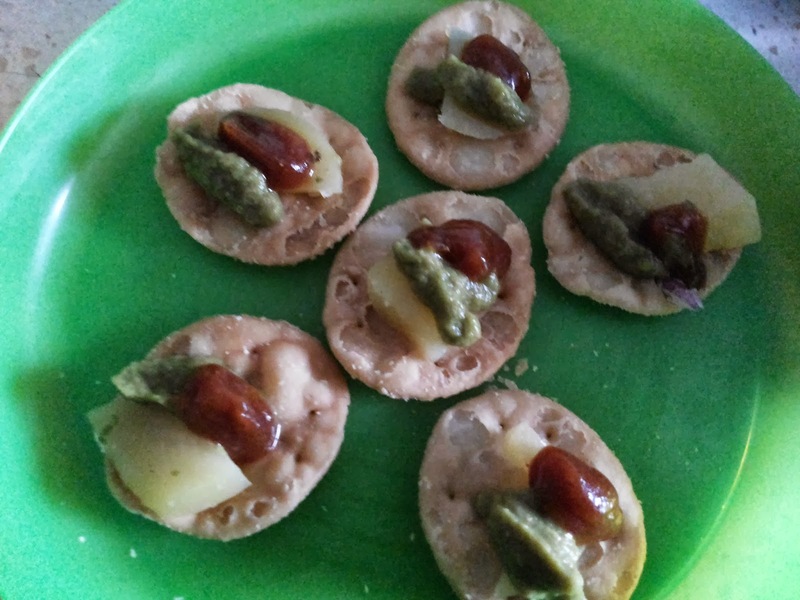 Everybody loves this and can be served as a appetizer, evening snack or as a substitute for meal. Hot/mint/green chutney and tamarind/sweet chutney is used to add extra flavor. You can skip it if needed. 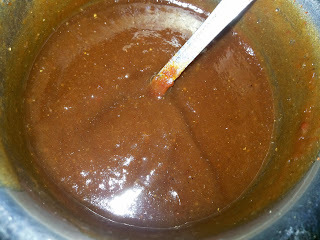 The 2 types of chutney prepared can be stored in an air tight container in a refrigerator and can be used for other purposes also. 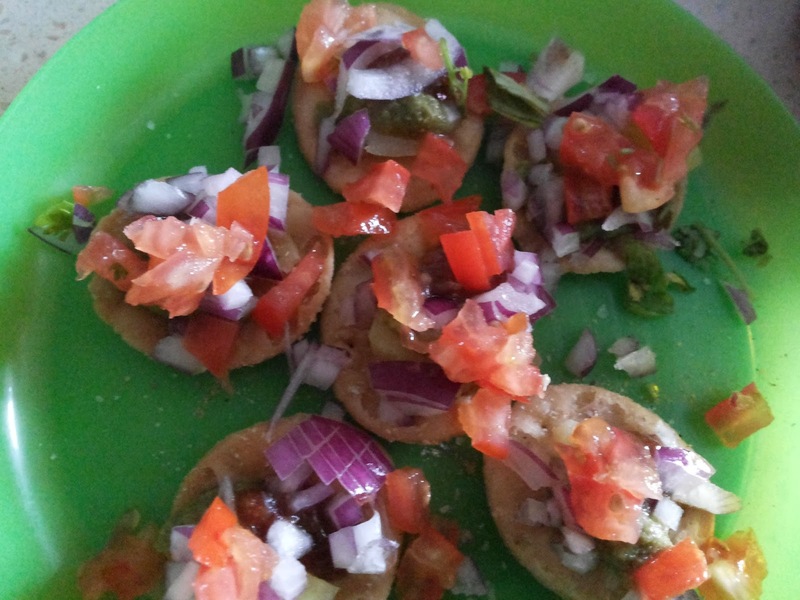 You can use pani puri's puri,sev puri's puri or even papdi. The garnishing can be adjusted as per the taste. Chaat Masala is used for better taste. In a bowl, take water,dates,salt and tamarind. Either heat it on stove for 3-4 mints or in a microwave for 1.5-2 mints until it is warm enough. To it add jaggery and allow it to soak in that warm water for 10 mints so that jaggery dissolves in it. After it cools, remove the seeds from tamarind and dates. In mixer jar, add only dates and tamarind by keeping the water as it is. Grind it into a smooth paste. Transfer the paste back into the same water (water with jaggery dissolved in it). In a wok, add the paste along with water and boil on a low flame. Add chilly powder and chaat masala. Allow it to boil and cool it before storing. Wash mint leaves and coriander leaves nicely. 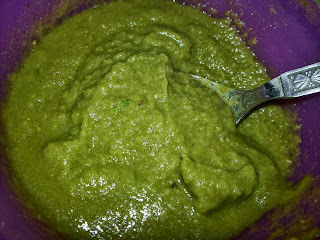 In a mixer jar, add mint leaves,coriander leaves,green chillies,garlic,cumin powder and salt. Grind it into a smooth paste by adding sufficient amount of water. Can add lime juice if needed and can be stored in an air tight container. In a plate, arrange sev puri. 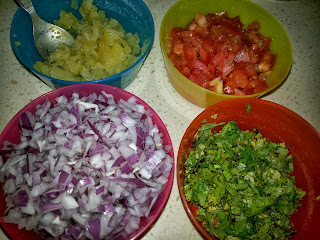 Spread finely chopped potato,tomato and onions on top of it. Add sweet/tamarind chutney and green/hot/mint chutney as needed. Serve and enjoy the taste.